See that branch? That's from my fabulous new Take Care stamp set and I'm very excited about it! I bought the set thinking it would come in handy for Easter with its sweet nest and eggs but the image I love the most is this branch - just think of all the things you can perch on that! For this card I brought in a couple of the birds from my Aviary set - aren't they cute?! I stamped a heart from my Little Additions set between them and it amuses me how startled they look! The sentiments from Teeny Tiny Wishes are always lovely and neat and understated, allowing the image to take centre stage. My husband doesn't normally get involved in our family silliness but whenever he does it's always a cracker! Yesterday he looked over at me when we were watching TV and, with a completely straight face, asked me: "Do you know what time Andy Murray goes to bed?" When I replied that I had no idea he smiled with satisfaction. "Tennish," he said. This was to pay me back for a time about twenty years ago when he accused me of being up to mischief. "You're looking positively elvish!" he said. "What?" I said. "Elvish Preshley?!" Hola Vicky, sweet, gorgeous and perfect CAS card. We have a BIG parade 5 january for the night of three kings, this night when the children are sleeping "the three kings leave the presents (all family have presents)for the good childrens buuut if you don't have been good child the kings can leave you charcoal(it's a black sweet candy)" :D, it's a very important day for all the family, after the lunch we eat the " Roscón de Reyes (large ring-shaped cake baked for Epiphany) with a king and a broad bean inside if you eat and the king is in your mouth you'll have very good luck for the year...all family is crazy eating for to find the king but if you find the broad been you pay the cake.It's a very fun day. What a fabulous anniversary card! LOVE that branch and the wee lovebirds. I'll have to check out that stamp set now as this is just wonderful and refreshing! So pretty. Tis is cute Vicky and you're right about the expression on the birds' faces! 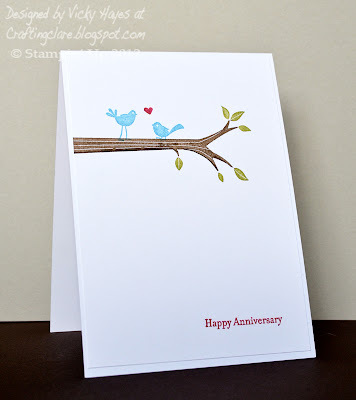 Love this very sweet anniversary card! The parade sounds super and so nice that it was sunny too! I think it's time the sun shone in the UK. And I so wish I could remember jokes - I'd tell that one to my DH!! Lovely card - really must have a play with my Aviary set, it still hasn't seen any ink! That's a cracker, your dh has hidden depths! Liking the card, it could be used be with other sentiments on it as well. Great card, that branch is really versatile. Sounds like a great day out, your blog did cheer me up. Very cute, I love the colors!